A Christmas Eve Menu and More! With Christmas around the corner and 2013 closes in and comes to an end, the festive holidays is just perfect for indulgence in every possible way. 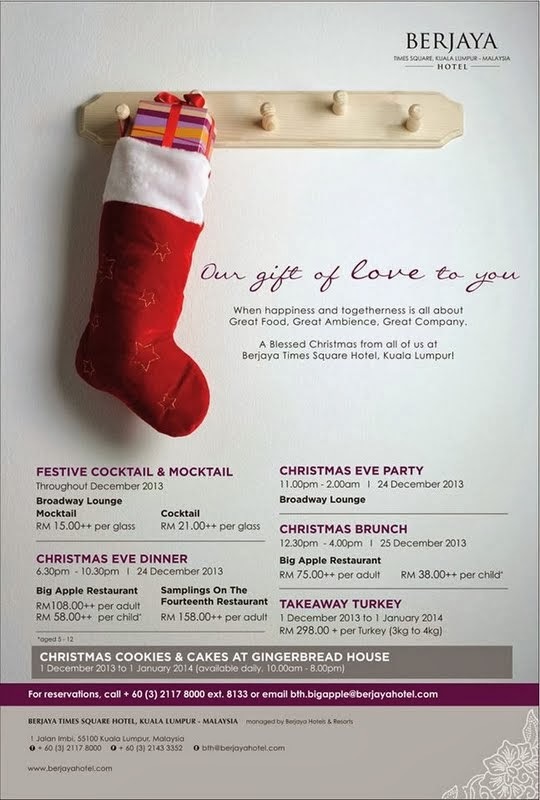 Berjaya Times Square Hotel, Kuala Lumpur is hosting various attractive offerings these holidays in the spirit of giving. Kick starting off the festive indulgence, Samplings on the Fourteenth is featuring a festive set menu on the eve of Christmas. The restaurant’s Chef de Cuisine, Chef Val, has specially designed the four-course meal to ring in the festive mood. What better way to indulge than to head on over to the 14th floor of Berjaya Times Square Hotel to enjoy a fine dining holiday meal with an amazing view of the cosmopolitan city at night! Our preview of the Christmas Eve menu was all dressed up in festive cheer and romance. Christmas tree and ornaments certainly made that evening unforgettable. As we waited for others to arrive, we even had some holiday drinks at the bar. Aptly named Grinch and Rudolph Goes Green, our cocktail and mocktail are just perfect to render in the festive mood. Rudolph Goes Green was so good, I had two of the sassy mocktail! Wine is not included in the set dinner but is available for order to be enjoyed with the festive set dinner. The first course featured Smoked Salmon and Prawn Salad served with Tomato Tart and Lemon Chive Vinaigrette. Taking center stage together are the slices of smoked salmon and prawns dressed in lemon chive vinaigrette and some caviar. What I like is the mille feuille tomato tart that brings out the bold juicy and savory flavors of the salmon and prawn. Simple and light, this dish is a great way to start the meal. The next course was a velvety Cream of Pumpkin Soup with a dollop of sour cream. To bring in warmness of Christmas, this pumpkin bisque is perfect with its sweet and warm flavors. Creamy and silky smooth, the light smokiness of the pumpkin is just right. A tinge of sour cream helps to layer more flavors to the bisque while a scoop of mashed pumpkin added more texture and depth to the flavors of the creamy pumpkin. Our palate cleaner was a pretty pastel pink of Minted Watermelon Sorbet. I have always felt that watermelon is one of the best fruit to cleanse the palate as it is fresh and bursting with loads of juicy notes. This one did its job well with the added freshness of mint. Main course features three options with a turkey, a lamb and a fish on the menu. I went for the cod since I have been craving for fish a lot these days. Roast Christmas Turkey served with Bacon Wrapped Sage & Onion Stuffing is served with roasted potatoes, buttered Brussels sprouts and carrots and cranberry apple sauce. Chef Val has cleverly updated the traditional Christmas dish to individual portions. It was a turkey roulade roasted till just right before being served with all the trimmings to it with the addition of fried sage leaves. The second option was a Slow Roasted Lamb Shank with Rosemary Jus, Parmesan Polenta and Grilled Baby Vegetables. For those who love hearty flavors of a good stew, the lamb shank is beautifully braised till tender. I would have loved to enjoy this since I am a huge fan of stews and creamy cheese polenta. My choice of Pan Seared Cod with Potato and Leek Mash, Wild Mushrooms Cured Cherry Tomato and Olive Tart and Saffron Nage was a great one. I was really pleased with the sweet thick cut of cod cooked perfectly. The juicy cod was topped with a luscious mash of potato and leek. Surrounding the fish was baby carrots, tomatoes, zucchini, snow pea and other vegetables in a pool of creamy saffron nage. I also enjoyed the tartness of the cherry tomato and olive tart a lot as it has great flavors and textures. It’s a great balance of flavors and textures executed with finesse! 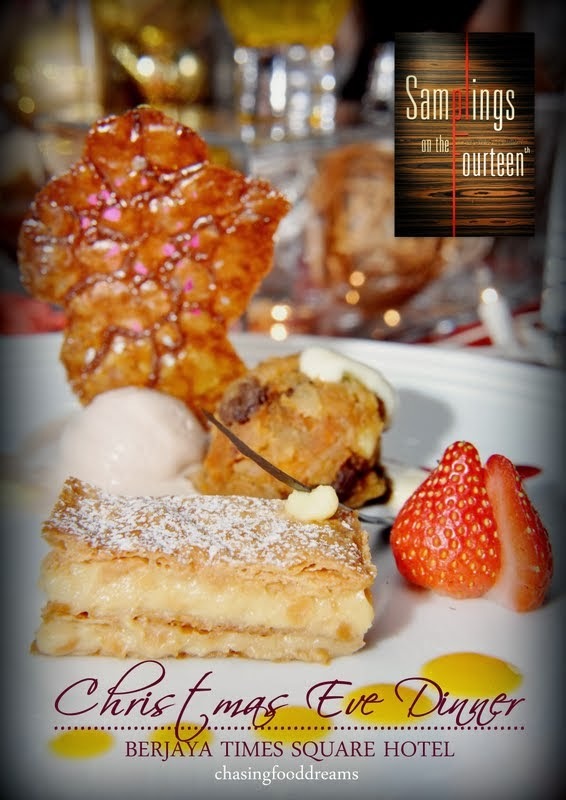 Our sweet ending of the meal was Chestnut Mille Feuille served with Orange flavored Christmas Pudding and Cinnamon Ice Cream. Chestnuts are a treat during this festive and most of it is usually featured in the turkey. I am glad I had a dessert from chestnuts as I have always liked the creamy and nutty notes of the chestnut in a sweet way. Here it is sandwiched with puff pastry and stacked up partnering with sweet fruity Christmas pudding and a silky cinnamon ice cream. The dessert shouts Christmas from all its ingredients and oozes with much holiday sweet note. A holiday set menu that is value for money and let’s not forget the enchanting city night view it comes with! 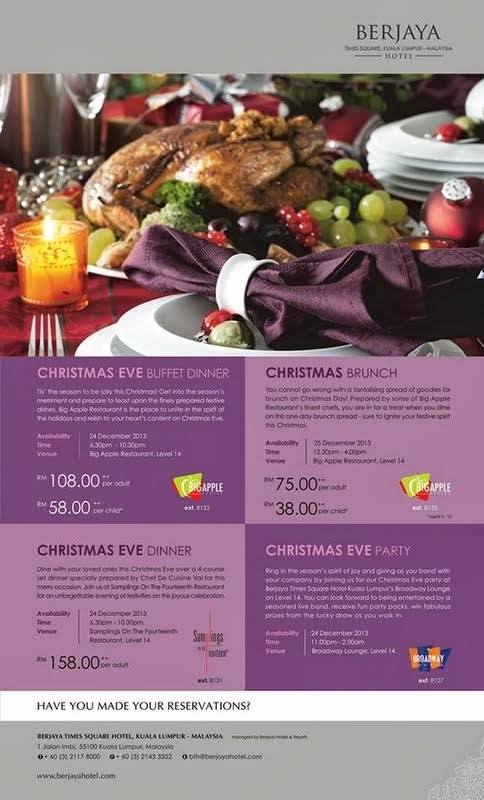 Samplings on the Fourteenth’s Christmas Eve four-course meal is priced at RM158++ per adult. I think we're having lamb shank for our Christmas dinner too, not having turkey - one bird's too big for a family of tree. Wouldn't want to eat the leftivers for days and days long after Christmas has gone past.